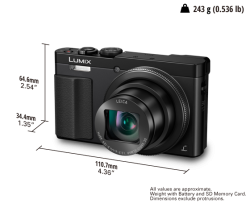 Product Review: Panasonic LUMIX TZ70 – New camera, lower spec ? Panasonic’s new flag ship pocket super zoom TZ70 (or SZ50 in some parts of the world) is, at a glance, not as good a choice as last year’s TZ60 (SZ40). But all is not what it seems. The first and most obvious example is the resolution. The TZ60 boasted an 18M sensor resulting in a 4896×3672 pixels where the TZ70 only give a 12MB sensor with 4000×3000 resolution. But considering that the actual sensor size is still the same, meaning the sensor space per pixels is greater than the TZ70. This results in a better sensitivity to light and means lower noise at high ISO’s making the TZ70 more suited to lower lighting condition. You still get the optical zoom of x30 and the addition of x4 Digital (35mm equivalent 24-720mm focal length) but being slightly heavier and larger, with a better designed grip, it’s that little bit easier to keep steady making the 720mm seem not as ridiculous prospect as its predecessor. In my opinion the image stabilization has been improved, as slight hand movement are smoothed out with image gliding. Unfortunately what really let this camera down are the features it’s lacking. First of which is the touch screen. Not seen since the TZ40. For those of you who have never used this, you may think is a junk feature but for a pocket cameras, much like smart phones, it is very handy when trying to compose a picture quickly with an off-centre focus point. 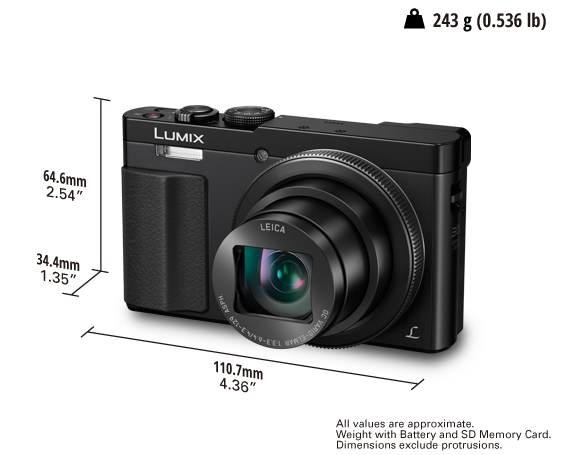 Panasonic seem to be striping this feature from anything below their GX range, as the overpriced LX100 would have been THE compact camera to have if only it had this feature. Even better was the “oh so useful” flip out screen that the GX7 waves neatly over the LX100. The 4K video shooting isn’t enough to warrant the high price tag without these features, but that’s enough about the LX100. Back to the TZ70; another feature found lacking is GPS. As I’m sure you’re aware location information is becoming increasingly important for photographers (especially at TakenPlace) and it seems like a real miss-step by the photography giant. The TZ60 had it, so why not the TZ70? Panasonic would argue their “Image App” can add geo-tags, but the images are only tagged when stored on the mobile device, when connected. This poses a real dilemma as you may not always want to carry both devices on your travels. And the Wi-Fi connectivity, as opposed to Bluetooth, could make you think twice. When connected the app’s live view function is extremely useful for taking self-portraits or photographs at awkward positions, allowing you to control the zoom and focal point. But this is all something we could do with the TZ60 or even the TZ40 back in Feb 2013. In summary, the TZ70 is a very powerful addition to your pocket but it’s not the jump in quality or features I’d expect to see. In fact the more savvy buyer might want to carefully consider the extra cost against features of earlier models or investing the extra in one of the GX series. If you love cameras and taking photos – why not register for a TakenPlace Early Access account and show the world the way you see your world (and theirs).